Step by Step sight-reading exercises for beginner piano, focused on accuracy of notes and rhythm over a range of difficulties. Can be collaborated between many users in order to set certain tasks and view their results. 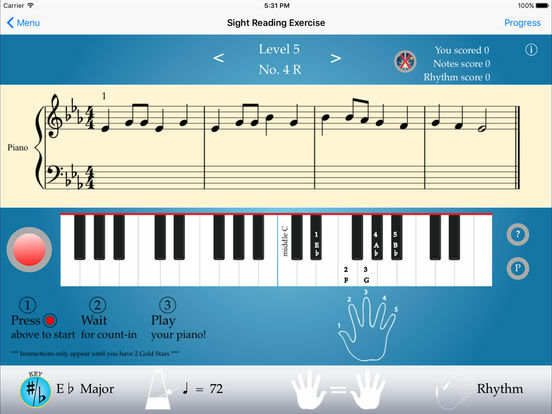 A great app, particularly for individual tutoring or learning piano in a formal manner. Excellent accuracy, as the app listens to the performer playing on a live piano, and assesses their accuracy in pitch and rhythm, and provides with an overall score. This app can be used in a variety of ways, but certainly encourages independence and positivity when developing sight-reading skills. It offers you to create a username, and then records your scores as you progress through each level, in order to improve your skills. For each level, you can press the record button, and it counts you in, before you then play on your piano. It listens to your performance and assesses quickly and accurately, to provide you with a response of a score, and whether you have passed the level. The app has a range of difficulties, with 10 different levels, starting with simple time signatures and rhythms, leading up to use of quavers (1/8th notes), use of rests, more developed simple and compound time signatures, and use of offbeat rhythms. These levels can be progressed through each key, of which you can choose at any point. So for example, if a student has been learning Eb major, you can then choose only the sight reading tests using this key, and run through each of the 10 levels, all in Eb major. This is fantastic for preparation for syllabus performance exams that are focused on certain keys, and also for whole class keyboard performance. A major benefit is that it provides the information of finger positioning, in order for students to independently place their fingers on the piano in the correct place, regardless of key. The student can then also run through all levels and keys in either the right hand, or the left hand. As each exercise is progressed through, positive encouragement and praise is demonstrated in the app via sounds and emoticons. A fantastic feature of this app is the connectivity between teacher and pupil, and even 5 other users too. You can invite 7 other people to share with your username, enabling the teacher to be able to set certain tasks as assignments, and to also monitor how the student is progressing throughout. If the rhythm becomes an issue during your sight-reading, it then offers you extra points by completing a rhythm card. This then takes out all the pitch concerns by providing you with one note, and focusing just on the rhythm, in order to get this fluent and correct. This is very helpful for beginning pianists in particular, for both young learners and adults, and those wanting to develop their skills. Further features include a very simple change of tempo in order to develop the complexity of your performance. It also offers a ‘clapping’ feature, where a voice reads out the rhythms as they go through, so that you can clap along, before adding in the performance on the piano with the correct pitches. This app requires no further purchasing and has no advertisements throughout, which is very helpful when you are trying to play the piano at the same time! However, there are some drawbacks to the app. When considering beginner pianists, even with only the initial tests and exams in a range of syllabi, a student is only required to learn the simplest of key signatures, but are expected to be able to play with alternate hands within the same exercise. As the syllabus progresses, they will then be expected to play with both left and right hands at the same time, and the key signatures slowly become more complex. However, this app uses all key signatures, leading up to some of the most difficult, but only learning one hand at a time for each exercise. These means that the app has limited access for those students preparing for exams. It also does not use minor keys, and therefore the student does not encounter accidentals, which even the most beginner of students experience fairly early on in their learning. Due to the lack of these elements, other learning resources would have to be utilised to fully prepare students for real-life application of sight reading skills. Despite this, it is a great app, particularly when trying to encourage students to practice at home and engage with sight-reading. It enables students to work independently without your frequent intervention and teaching, and certainly will help them to learn and progress with their performance skills.